If you could place your current consciousness back into your younger self, what would you change? Would you ask out that girl? Save a loved one from tragedy? Would you pull a Biff Tannen and amass a fortune betting on horse racing? Blake Crouch’s Recursion is a look at just that scenario. Can someone truly go back and make minor changes and still avoid the ripple effect? Probably not. 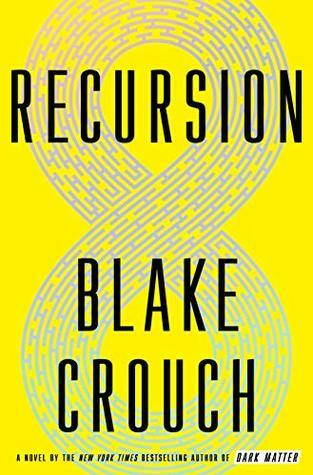 For Blake Crouch’s Recursion, it’s a lesson in messing with timelines and avoiding the unavoidable. I’ve always been fascinated with time travel. Back to the Future is usually where my mind goes when I think of one of the better uses of the idea, but there are many great examples including Stephen King’s 11/22/63, that episode of the Simpsons where Homer builds the time traveling toaster and Army of Darkness. But for all the great ones, there can be others that fall flat on their face (Kate & Leopold). Thankfully, Blake Crouch takes the premise and excels with it. It wasn’t until a few days after I finished the book that I realized the plot – or at least the way in which time travel is executed – somewhat resembles 2004’s The Butterfly Effect. I don’t think it’s all that fair to compare the two because, honesty, Recursion is exponentially better, but the comparisons are there. Although I did find some of the sciencey stuff supporting the act of traveling difficult to follow, I understood it on a basic level and Crouch didn’t seem to spend overly long explaining the ins-and-outs of it (DMT chemical release and mind-mapping), so you’re not left like Bruce Willis in Looper slamming his fists on the table refusing to discuss time travel worried he’d be there all day talking about it, making diagrams with straws. Don’t take that the wrong way though, I’m not dismissing Crouch’s work. It’s exceptional. It’s just that time travel is tough and once you get into the nitty gritty of it you’ll drive yourself mad trying to make sense of it sometimes (I once had a short, but very loud argument with a friend of mine about time travel in Terminator 3). Probably because it’s not possible, so you’re trying to make sense out of an impossible act. Boy, does this one get dark. But, that’s to be expected if you’ve read Crouch’s work before. Just like having his characters mess with the multiverse in his previous novel Dark Matter, nothing good can come with screwing around with timelines in Recursion. There are some exceptionally haunting moments in this story that were written so unnervingly well. One of my biggest personal fears comes to life in the last third of the book and the way in which Crouch executed it left me speechless. While the book isn’t out until June, I expect to spend the next four months pushing this on all my friends. I would not be surprised to see it on my 2019 year-end list. ***I wasn’t surprised to see that Netflix is picking this up for adaptation. I think the idea of making it into both a TV show and a movie is a tad ambitious as I’d hate to see the plot watered down to expand to a bigger story than it needs to be, but I don’t want to dismiss it before it happens. I really enjoyed his Dark Matter and Wayward Pines. With your review, I think I’d like this one!